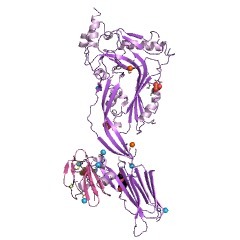 Three-fold repeated domain in urokinase-type plasminogen activator receptor; occurs singly in other GPI-linked cell-surface glycoproteins (Ly-6 family, CD59, thymocyte B cell antigen, Sgp-2). 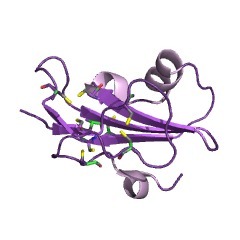 Topology of these domains is similar to that of snake venom neurotoxins. 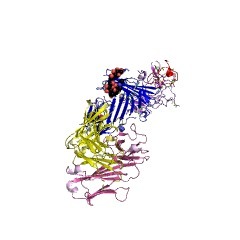 This entry represents a three-fold repeated domain in urokinase-type plasminogen activator receptor (uPAR) that occurs singly in other GPI-linked cell-surface glycoproteins (Ly-6 family, CD59, thymocyte B cell antigen, Sgp-2). A variety of GPI-linked cell-surface glycoproteins are composed of one or more copies of a conserved domain of about 100 amino-acid residues [(PUBMED:1850423), (PUBMED:8394346)]. 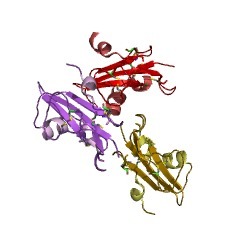 Among these proteins, U-PAR contains three tandem copies of the domain, while all the others are made up of a single domain. 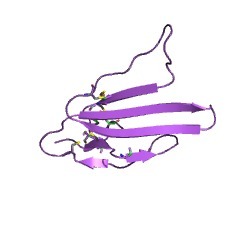 As shown in the following schematic, this conserved domain contains 10 cysteine residues involved in five disulphide bonds - in U-PAR, the first copy of the domain lacks the fourth disulphide bond. 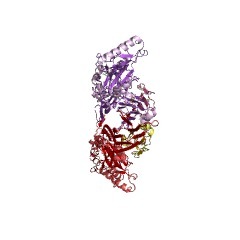 There are 5680 LU domains in 4879 proteins in SMART's nrdb database. Taxonomic distribution of proteins containing LU domain. This tree includes only several representative species. The complete taxonomic breakdown of all proteins with LU domain is also avaliable. Click on the protein counts, or double click on taxonomic names to display all proteins containing LU domain in the selected taxonomic class. 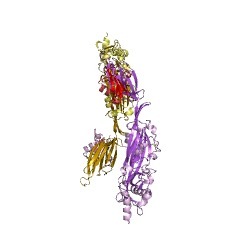 Three-dimensional solution structure of the extracellular region of the complement regulatory protein CD59, a new cell-surface protein domain related to snake venom neurotoxins. 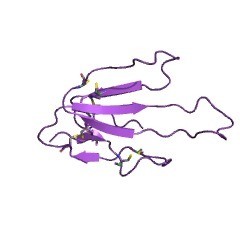 The cell surface antigen CD59 is an inhibitor of complement-mediated lysis and a member of the Ly6 superfamily (Ly6SF) of cysteine-rich cell-surface molecules whose sequences are related to those of snake venom neurotoxins. 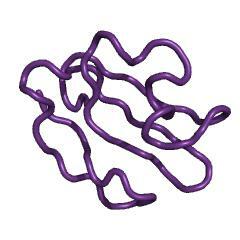 The three-dimensional solution structure of a recombinant form of the extracellular region of the molecule (residues 1-70 of the mature protein; sCD59) has been solved by 2D NMR methods. 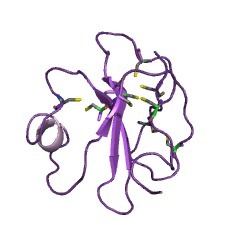 sCD59 is a relatively flat, disk-shaped molecule consisting of a two-standed beta-sheet finger loosely packed against a protein core formed by a three-stranded beta-sheet and a short helix. Structure calculations allowed an unambiguous assignment of the disulfide-bonded cysteine pairs as 3-26, 6-13, 19-39, 45-63, and 64-69. 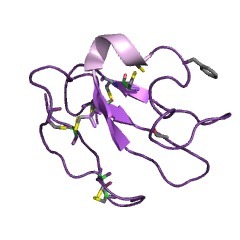 The topology of sCD59 is similar to that of the snake venom neurotoxins and consistent with an evolutionary relationship existing between the Ly6SF and the neurotoxins. 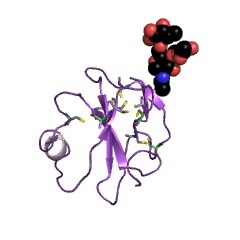 Structure-function relationships in the receptor for urokinase-type plasminogen activator. Comparison to other members of the Ly-6 family and snake venom alpha-neurotoxins. Plasminogen activation is regulated by the interaction between urokinase-type plasminogen activator (uPA) and its specific glycolipid-anchored cell surface receptor (uPAR). 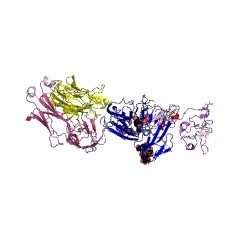 uPAR is composed of three homologous domains and is the only multi-domain member of the Ly-6 family of glycolipid-anchored membrane proteins. 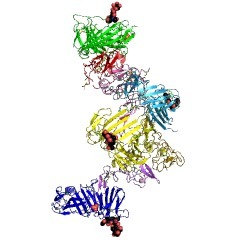 Recent evidence has highlighted similarities between the individual domains of uPAR and the large family of secreted, single domain snake venom alpha-neurotoxins, suggesting that uPAR may adopt the same gross folding pattern as these structurally well characterized proteins. 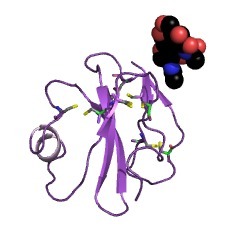 Structural aspects of the binding between alpha-neurotoxins and the acetylcholine receptor may have a major influence on future studies of the interaction between uPA and uPAR. 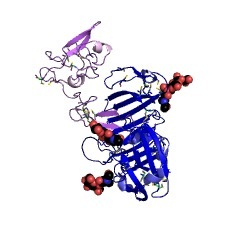 The ligand-binding domain of the cell surface receptor for urokinase-type plasminogen activator. 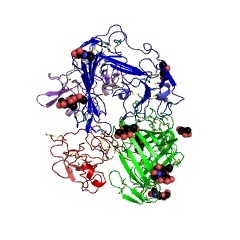 The purified urokinase plasminogen activator receptor (u-PAR) was cleaved into two fragments by mild chymotrypsin treatment. The smaller fragment (apparent Mr 16,000) possessed the ligand-binding capability, as shown by chemical cross-linking analysis. 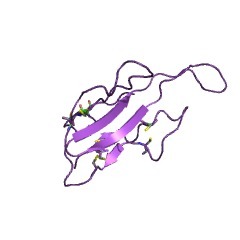 This fragment constituted the NH2-terminal part of the intact receptor, probably including the whole sequence 1-87, and contained N-linked carbohydrate. 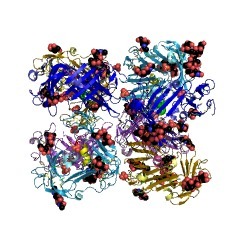 After detergent phase separation in the Triton X-114 system, the fragment was present in the water phase where its binding activity could be demonstrated in the absence of the rest of the protein. 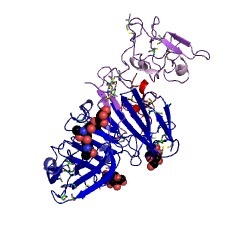 An analysis of internal homology in the amino acid sequence of u-PAR revealed the presence of three repeats of approximately 90 residues each. 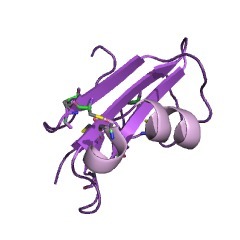 The ligand-binding fragment corresponds to the first repeat, supporting that this unit is a structurally autonomous domain. 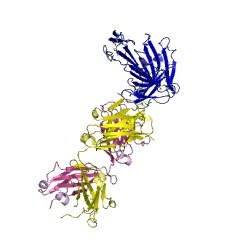 Domains homologous with the internal repeats of u-PAR constitute the extracellular part of Ly-6 antigens and of the squid glycoprotein Sgp-2. 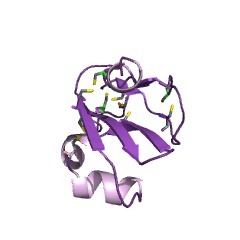 Like u-PAR, these proteins are attached to the membrane by a glycosyl-phosphatidylinositol anchor. The hydrophilic, ligand-binding u-PAR domain identified in the present study has potential applications in interfering with cell-surface plasmin-mediated proteolysis. 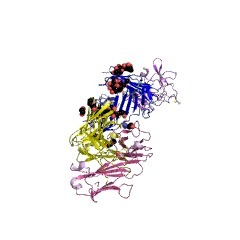 Protein structure and membrane anchorage of the cellular receptor for urokinase-type plasminogen activator. This information is based on mapping of SMART genomic protein database to KEGG orthologous groups. Percentage points are related to the number of proteins with LU domain which could be assigned to a KEGG orthologous group, and not all proteins containing LU domain. Please note that proteins can be included in multiple pathways, ie. the numbers above will not always add up to 100%. 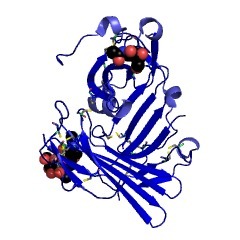 2l03 Spatial structure of water-soluble Lynx1.